Sometimes we don’t understand His thinking; and sometimes we just plain don’t agree with His choice of leaders, so we must remind ourselves that even in the tough times God is still sovereign over all. Jesus is still His Son. The Holy Spirit still comforts. The Bible is still true. Heaven still awaits all believers. We can rest assured that God still loves us and patiently waits for us to come to Him so He can shower us with His love, grace, and mercy. When we do, He will show us how to extend His love to others…regardless of how they voted. Is Christianity Making a Come Back? 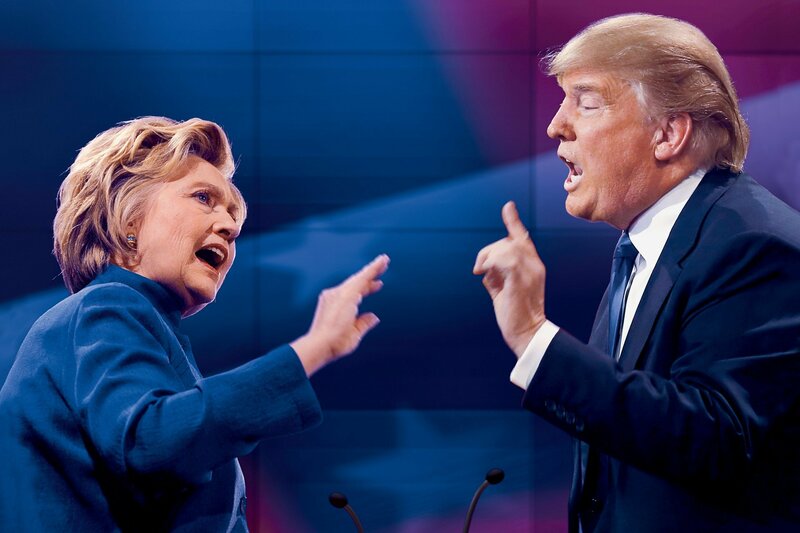 Have you noticed that politicians have finally tuned in to the rising up of the not-so-silent majority? In an effort to capture our votes, politicians are suddenly professing their faith in Jesus Christ; calling for a return to decency and doing what’s right instead of what’s politically correct; and most amazing of all, political pundits and some politicians themselves actually sported cross-shaped ashes on their foreheads on national TV Ash Wednesday. It symbolizes that we were created from dust by Him and to dust we shall return… on His time schedule. 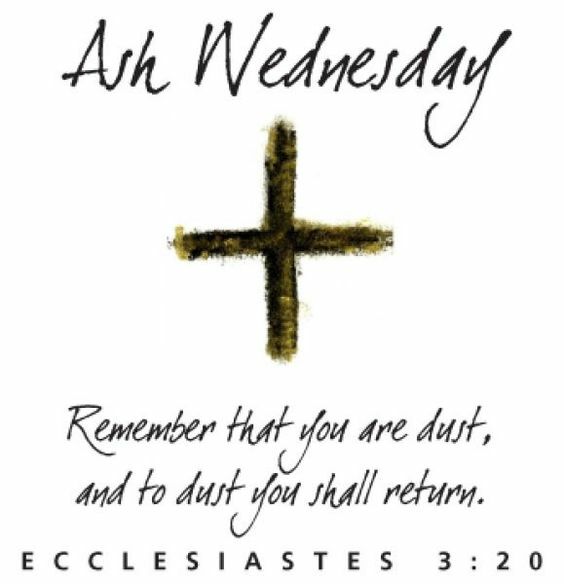 So ashes on the forehead remind us of our mortality and encourage us to turn from our sins before we face our Creator on our own personal day of judgment. Of course I didn’t understand all that spiritual significance when I was growing up. We didn’t have the Ash Wednesday ritual in my church. Or, if we did, I was unaware of it. But, like many teenagers I wasn’t aware of a lot of things. So I was shocked when our teacher, Miss Phlegar, strutted into our sophomore English class at Dobyns-Bennett High School in Kingsport, Tennessee sporting a sharp-pointed cross on her forehead that looked like it had been applied with a thick black magic marker. There was nothing subtle about it; but there was nothing subtle about Miss Phlegar either. She was a joyful soul with twinkling eyes, a mischievous grin that made me wonder why she was so happy all the time, and a short perky haircut with turned up ends that always reminded me of what a teenage water buffalo must look like. She elevated her short, stout figure with thick three-inch high heels in which she strolled in front of the class as if amused by her authority. Miss Phlegar seemed to know who she was and whose she was. And, she was happy about it and behaved accordingly. Not so today’s politicians. Their walk doesn’t quite match their talk. They engage in shouts, obscenities, and name-calling that violate the new covenant of love, grace, and mercy…but don’t we too on occasion. It’s hard to tell if Christianity really is making a come back because we are all sinners still misbehaving, seeking forgiveness, and thankful we are saved by grace alone. So while the vote is still out, I only hope. But God only knows. From the beginning when God created a perfect world and sinless people to walk with Him in His garden, sin entered that perfect world through Adam and Eve’s foolish decision and their resulting disobedience. Hence, our nature to sin has been passed down through every generation. But God cannot look upon sin, so He sent His Son to this earth to pay the price for our sin and win us back into fellowship with Himself. As a youth, Jesus astounded the religious leaders of the day with the depth of His knowledge and understanding of the Holy Scriptures. But then again, He should know them. They were inspired by His Father, with whom He’d already spent eternity past. Finding Himself in human form, Jesus stayed in close personal contact with His Father to follow His will, saying and doing only what His Father told Him to say and do. He was the one and only perfect human being. Without sin. Obedient to death. Describing that harrowing moment, Pastor Tony Evans said, “Jesus became sin, severing Himself from the fullness of the intimacy He had always known with His Father. As the sin of the whole world shot through His body, God the Father turned His back on His Son…Jesus endured the distance, the desertion, and the rejection for us.” For us! Thankfully, our journey to forgiveness isn’t nearly as painful as crucifixion. It only requires a humble heart, a desire to be cleansed of all unrighteousness, and bowing the head or bending the knee. Pretty simple, huh; but mandatory if we want peace in our lives here and on the other side of eternity. I know how he feels, don’t you? Thankfully Jesus provided the way to rid ourselves of the burden of sin. Wow! All we have to do is ask with a sincere heart. When we forgive people who’ve done us wrong, our heavenly Father forgives us of the wrongs we have committed. If we do not forgive, we will not be forgiven. In other words, what goes around comes around. What we send out boomerangs back to us. During this season of forgiveness, we celebrate the resurrection of the Lord Jesus–the One who loved us and gave Himself up for us as a fragrant offering and sacrifice to God for the forgiveness of our sins. So let us also take time to forgive those who have hurt us and to seek forgiveness from those whom we’ve hurt. 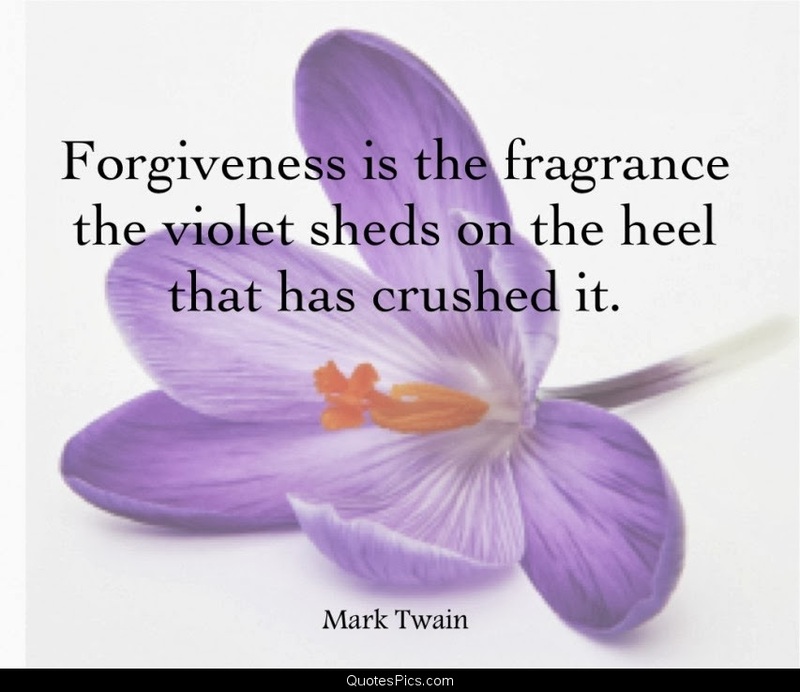 That simple act of forgiving will release burdens, rejuvenate friendships, restore our fellowship with God and add the sweet fragrance of peace to our lives. “Happy Easter,” I said to the young cashier in the check out line as she bagged my groceries. “He is risen!” I added joyfully. Immediately her world of chocolate bunnies, marshmallow chickens, and brightly colored eggs plummeted to the stark reality that God had invaded her vision of Easter. She stood in perfect stillness, her face registering no expression and no understanding of what “He is risen” really meant. Utterly speechless, she turned to her next customer. In “Our Nation Now,” The Associated Press referred to 2013 as “The Year of Dysfunction, Discord and Distrust.” Pew Research Religion and Public Life Project October 9, 2012 reported 13 million self-described atheists and agnostics and 33 million people in the U. S. who say they have no particular religious affiliation. If that is true, where are those lost souls going to hear the message that Jesus has risen from the grave? The Barna Update, a newsletter of Christian statistics, reports that only four of every ten people who attend church regularly are born again Christians. Look around you next Sunday. Someone sitting close to you is not saved. They do not understand, “By His power God raised the Lord from the dead, and He will raise us also,” (1 Corinthians 6:14) if we only believe. Perhaps they think it’s impossible. But, nothing is impossible with God. Perhaps they need proof. The disciples needed proof, too. Jesus’ death had left them scattered, disillusioned and fearful. So, “After His suffering, He showed Himself to these men and gave many convincing proofs that He was alive. He appeared to them over a period of forty days and spoke about the kingdom of God,” (Acts 1:3-4). Perhaps they need to hear the message of Jesus’ resurrection from a friend. Paul wrote to his friends in Corinth, “For what I received I passed on to you as of first importance: that Christ died for our sins according to the Scriptures, that He was buried, that He was raised on the third day according to the Scriptures, and that He appeared to Peter, and then to the Twelve. After that, He appeared to more than five hundred of the brothers at the same time, most of whom are still living, though some have fallen asleep. Then He appeared to James, then to all the apostles, and last of all He appeared to me also, as to one abnormally born,” (1 Corinthians 15:3-8). Perhaps you are that friend. Share God’s promise that, “Everyone born of God overcomes the world…he who believes that Jesus is the Son of God,” (1 John 5:4-5). That belief comes from hearing the Word of God. So, share the good news this week, even with the girls at the cash register. He is risen! And your friends can too, if they only hear The Word. Heavenly Father, Thank you for the promise of eternal life, that “He will swallow up death forever… and will wipe away the tears from all faces.”(Isaiah 25:8). Did you know that people learn a lot about us when we they hear us pray? Through prayer, we reveal what is foremost in our hearts and on our minds. As Jesus faced His crucifixion, He prayed for unity, and He allowed His disciples to listen as He prayed for Himself, for them, and for us as future believers. We are privileged to read His Words. In the first three verses of John 17, we witness the intimate interaction of the Holy Trinity–the divine mystery of perfect unity. Listen as the Holy Spirit prays from the realm of eternity to God the Father for Jesus, the Son. Listen as He intercedes for Jesus. To know that the Holy Spirit intercedes for us today, in the same way, is beyond my understanding. But Jesus continued this High Priestly prayer by giving an account of how He lived His life here on earth. Jesus recalled for God that He had revealed Himself to His disciples. He gave His disciples the Words God had given to Him. He prayed for their protection from the evil one, and He prayed for their sanctification–that they would be set apart as believers. Then Jesus explained that He set Himself apart to die for us so we could be set apart to live for Him. He told His Father He had lived His whole life, “So that they may be one as We are one.” In other words, He prayed for the unity of His disciples. Unity. That special oneness with the Holy Spirit. That Holy Spiritual bond that crosses the boundaries of denominations and knits His church family together. Isn’t it comforting to know that we are on His prayer list? Can you imagine? Jesus, Son of the Most High God, not only loves us and wants perfect unity with us, He wants us to be with Him where He is. He wants us to see His glory. Jesus taught His disciples, so they could teach us. Now, we are to continue the work that God has called us into perfect unity to do. When we focus on Jesus instead of ourselves and jointly seek a closer walk with Him, we are assured a closer relationship with each other. We are assured the unity He seeks. We can do this. For Jesus’ sake. Heavenly Father, Thank You for hearing our prayers, too. Help us to set ourselves aside and follow Your will to protect the precious unity of Your church. Have you ever noticed how people respond to change? Some love it and readily adapt to it. Others gripe, grumble, and resist. But those who feel most threatened by change are the ones in charge of the old way– especially when the new way of doing things wasn’t their idea in the first place. It’s the same today as it was in Jesus’ day. When Jesus began His ministry, He began a transition from the law to life everlasting. The Pharisees, or teachers of the law, violently opposed Him because He threatened their secure positions socially, politically, and religiously. But Jesus came into this world to seek and to save that which was lost. He came to save us instead of to hold us hostage to a lot of rules made up by the religious rulers of the day. And He performed miracles so that we might believe and have life in His name. Some believed. Some didn’t. Some–like the Sanhedrin, the high Jewish Court of Chief Priests, Elders, and the Pharisees–wanted to kill Him. And the battle between good and evil raged on especially after Jesus raised Lazarus from the dead. But, that miracle gave the people hope. Jesus’ miracles represented a real dilemma for the Pharisees. If they let Him go on teaching and working miracles, everyone would believe in Him. If everyone believed in Him, the Romans would take away their temple, their nation, and–to their way of thinking–the prestige of their position as teachers of the law. The interesting thing is that Caiaphas didn’t know God had prompted him to prophesy that Jesus would die for the Jewish nation and all the scattered children of God. Caiaphas didn’t know that his actions would bring them together and make them one as Jesus said, “one flock and one Shepherd.” But Jesus knew. When Caiaphas and the Pharisees plotted to take His life, Jesus withdrew with His disciples to Ephraim, a village near the desert, to continue teaching, encouraging, and preparing them for His death. Why? Because they would be the ones to spread the Gospel to the world. Then six days before Passover, when the Jews celebrated God’s delivering them out of Egypt, Jesus and His disciples went back to Mary, Martha, and Lazarus’ home for a dinner in His honor. The next day a great crowd of Jews who had seen Jesus raise Lazarus from the dead heard that He was on His way to Jerusalem, so they went out to cheer for Him, wave palm branches, and shout, “Hosanna! Blessed is He who comes in the name of the Lord,” (John 12:13). I hope Jesus enjoyed that brief moment of praise during His entry into Jerusalem on that first Palm Sunday. It was the only time during His ministry that He received a hero’s welcome. But, “As He approached Jerusalem and saw the city, He wept over it and said, ‘If you, even you, had only known on this day what would bring you peace—but now it is hidden from your eyes. The days will come upon you when your enemies will build an embankment against you and encircle you and hem you in on every side. They will dash you to the ground, you and the children within your walls. They will not leave one stone on another, because you did not recognize the time of God’s coming to you,’” (Luke 19:41-44). In other words, they didn’t recognize Jesus as the Messiah. They did not recognize the time of His visitation here on earth. 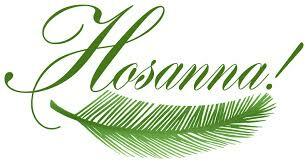 As we celebrate Palm Sunday, I hope you recognize Jesus as the Messiah. I hope you will set aside a time to praise Him for who He is and all He has done for you. And if you don’t know Him as Lord and Savior of your life, I hope you will welcome a change in your beliefs and shout, “Hosanna!” For only Jesus can resurrect the dead to everlasting life. 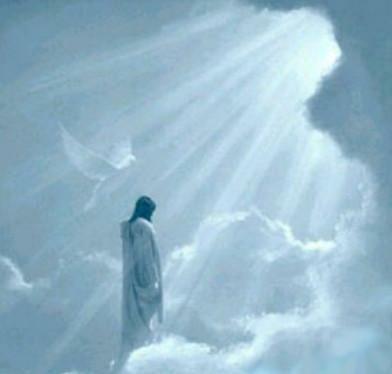 Heavenly Father, Thank You for Your Son and for the brief time of praise He received while He was here on this earth. May He continually hear our praises now that He is safely back home with You.